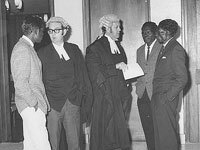 In 1968, after their petitions to Parliament failed to gain recognition of their rights to land, Yolngu people from Yirrkala in eastern Arnhem Land took their case to the Northern Territory Supreme Court. 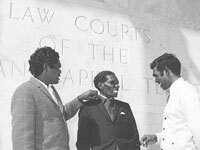 The leaders in this action, known as the Gove Land Rights Case, are pictured in Canberra in September 1970, outside the ACT Supreme Court building. 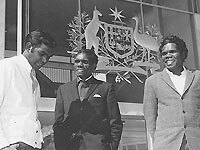 The High Court met there in Canberra for a ruling on the case, decided by the Northen Territory Supreme Court in 1971.